The progress bar shows the bill’s status while the gauge shows its probability of movement. 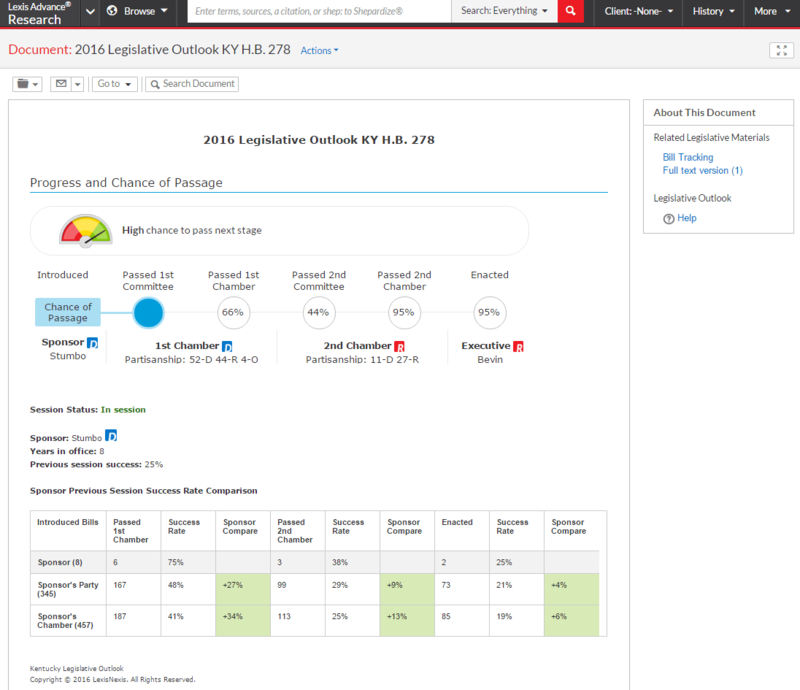 LexisNexis today introduced a new legislative tracking tool, Legislative Outlook, that uses predictive analytics and data visualization to indicate the probability of a bill’s passage. The new tool became available today as part of a package of updates to the LexisNexis legal research service Lexis Advance. It will be available to all Lexis Advance subscribers through November at no extra charge, after which it will be sold on a subscription basis. Also part of today’s Lexis Advance update is access to the entire LexisNexis news archive dating back 60 years. Previously, the archive was fully available only via Lexis.com. The archive includes news sources such as The Washington Post, The New York Times, The Wall Street Journal and ALM publications. I was given a preview demonstration of Legislative Outlook yesterday by Jeff Pfeifer, vice president of product management for the North American Research Solutions business at LexisNexis. Legislative outlook in detail shows more information about how the bill’s prospects were determined. Pfeifer said that two themes drove development of Legislative Outlook. One was to use data visualization to present information about a bill visually, so that a researcher can quickly glean where a bill is in the legislative process. The other was to use predictive analytics to forecast how likely it is that a bill will move to the next stage of the legislative process. A progress bar that shows the status of the bill and how far it has progressed. A legislative outlook gauge that shows the probability that the bill will advance to the next stage. The gauge shows the probability as green for high, yellow for medium or red for low. If a bill has passed, the entire gauge shows green. If a bill is dead, the gauge shows red. Details can be viewed about the bill’s history and revisions. 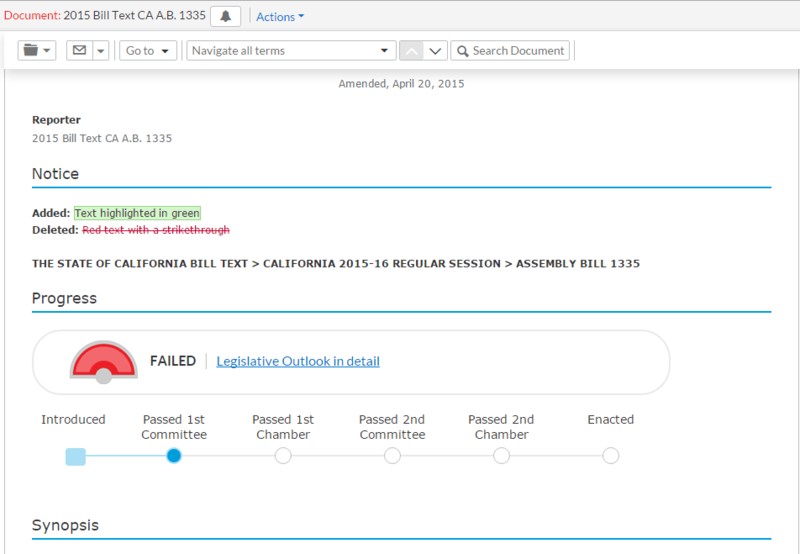 From the gauge, a user can click through to see a more detailed report of how the legislative outlook was measured. The algorithm measures about 20 data points, Pfeifer said, such as the influence of the bill’s sponsor, likely roadblocks in the committees the bill must pass through, and the political parties of committee members. 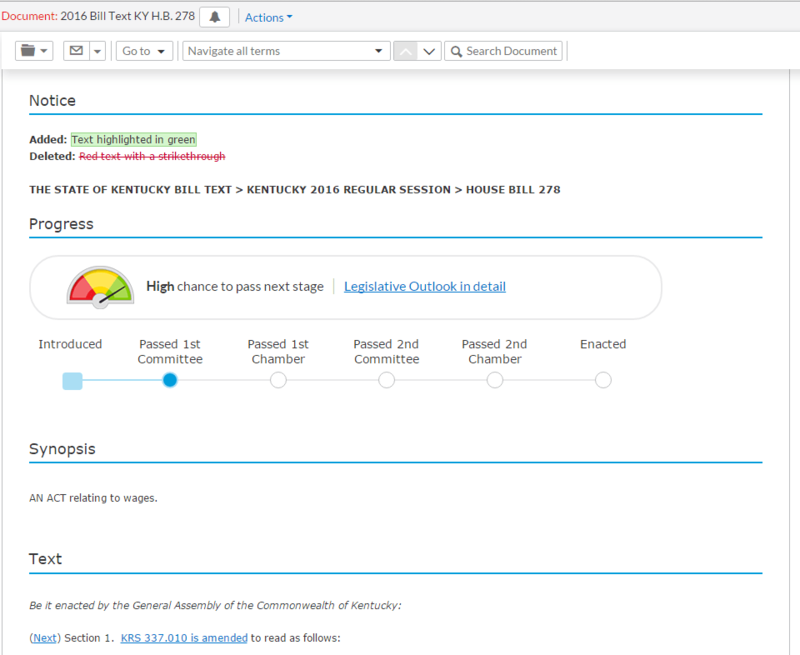 Legislative Outlook is not a substitute for the LexisNexis State Net legislative tracking service. Whereas State Net is for professional lobbyists and legislative staffers, Pfeifer said, Legislative Outlook is for users who want a more general way to track the status and prospects of legislation.